Born in King’s Lynn, Gary had started his career as a striker with the Kings Lynn youth team in 1991, and went on to play for a number of East Anglian clubs prior to his arrival at Nene Park, including Wisbech Town and Fakenham Town. 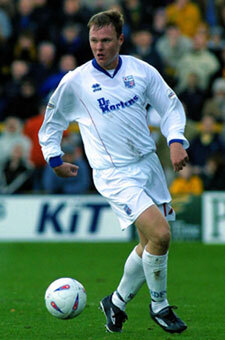 He stepped up to join Conference side Kettering Town in August 1999, where he made 35 appearances. 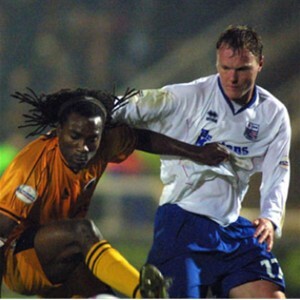 Gary arrived at Nene Park from Kettering Town on 14 June 2000, at the start of the Conference winning season and proved to be an excellent utility player, providing cover when Paul Underwood was injured and playing in midfield and attack if required. He remained with the club into the Football League, being a dependable cover player or substitute but was released on 20 May 2003 as the club moved up into Division Two. He joined Tamworth at the start of the following season, but personal circumstances saw his contract cancelled in January 2004, with a move back to King’s Lynn and he remained with the Linnets until June 2005. He joined AFC Sudbury for a season, before a move to Swaffham Town in the summer of 2006. After two years, he moved to Wisbech Town in June 2008 to become player / assistant manager, taking up the manager’s position in November 2008. After King’s Lynn were wound up in November 2009, on 18 January 2010, he was appointed joint manager (with Kevin Boon) of the newly created Lynn FC – formed from the ashes of the old King’s Lynn, with the aim of creating a team for the 2010/2011 season. The club was later renamed King’s Lynn Town, joining the United Counties League Premier Division. He became sole manager of Kings Lynn Town, but was unable to lead them to the United Counties League title, despite far greater resources than their rivals, although they were awarded promotion at the end of the 2011-12 due to ground grading issues at the champion club. He then went on to manage the Linnets for almost 400 games before leaving in early 2017, taking up a similar role at Wisbech Town later that year. His Wikipedia entry can be found here.